I live in Southern California about 10 minutes from the beach, so for my family towels and bathing suits are always drying in the backyard. Personally, I can’t stand the clutter it has caused and that half the time towels were hanging over the backs of our chairs limiting the available seating. So, in desperate measures last summer we bought a cheap, horrible metal towel rack that has been permanently set up in our backyard all summer. It has finally gotten to us and we couldn’t stand starring at it any longer. My husband and I chatted about a few possible things we could build that would be more appealing to the eye. Once we came up with a few ideas we priced out how much they would be to build and realized we had an even faster, easier and cheaper option. The Applarao wall panel from Ikea was the perfect solution. For only $39 this would take up far less space and give a place for bathing suits, our turkish peshtemal towels and others items to hang from. The 6 hooks are included in the price too. The assembly was minimal and only took 4 nails to secure it to our outside wall. I love when a simple, inexpensive purchase is going to make me such a happier mommy. The hooks aren’t secured so we can move them around as we want, which I love cause my daughter can reach her bathing suit at the bottom, along with the watering can she loves to play with in the backyard. 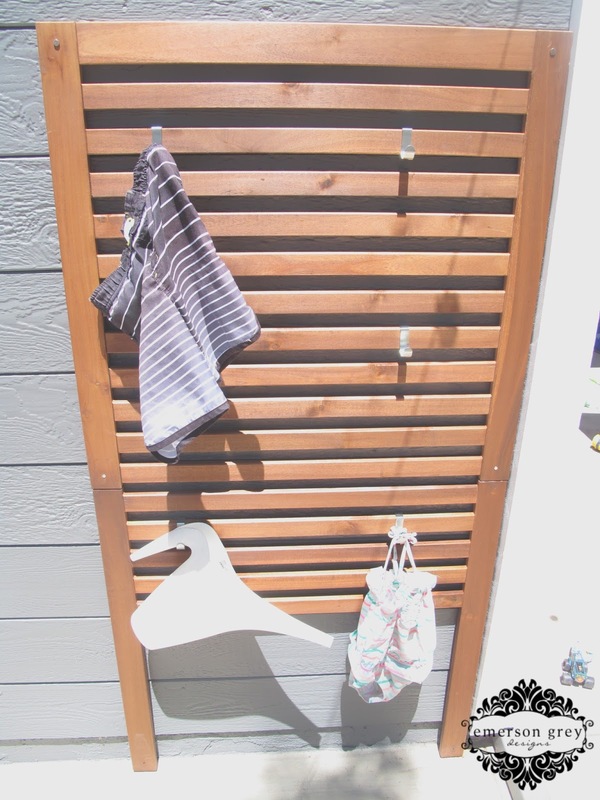 If you have a similar issue with suits and towels everywhere I definitely wanted to suggest this simple backyard organization option.